Was born in Gilmantown, Belknap Co., N.H., April 27, 1806, where his parents resided for many years. 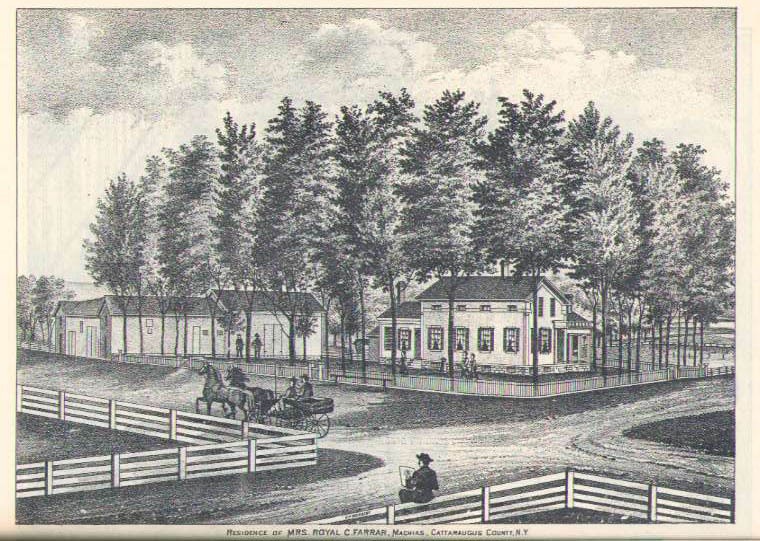 In 1818 he moved to New Berlin, N.Y., and from thence to Rochester, N.Y. In 1819, with his father and family, he emigrated to Machias, Cattaraugus Co., N.Y. He was younger brother of Wiggin Farrar, and remained with the family until he attained his majority. After spending a few years at farm labor, working by the moth, he purchased, in 1832, the farm where he spent the remainder of his days, where he died, and where his widow now resides, --one of the finest farms in the town, and so rated by the assessors. Mr. Farrar was not an office-seeker, but held the office of assessor for several years, and some other minor positions. He was an unostentatious, hard-working man, who rather avoided publicity, and stuck close to his chosen vocation, --that of a farmer. The three hundred acres of which he was possessed had been so wisely managed as to leave upon his death a competence for his family. He died Jan. 31, 1875, highly esteemed as a citizen and neighbor. By his first wife, Sarah A. Bradley, whom he married in 1835, has but two surviving children: Martin V. and Melville. The former is living in Canborough, Canada; the latter (who served in the war of the Rebellion, as a faithful and brave soldier of the 72d New York Volunteers) is a successful cattle-broker, and resides in Machias. Mrs. Farrar died in 1845, and the following year Mr. Farrar married Miss Luna Roscoe, daughter of William Roscoe, of Machias. Her demise occurred in 1847, leaving one daughter, Luna E., who married Mr. A. P. Adams, a merchant of Machias, in 1870. Mr. Farrar made a third venture in matrimony April 25, 1850, by taking as his companion, Maria E. Spoor, of Farmersville, daughter of Asel Spoor, who settled in that town as early as 1826. Mrs. Maria (Spoor) Farrar was born in Acadia, Wayne Co., N.Y., Oct. 9, 1824. There were born unto Royal and Maria Farrar seven children, --Sarah E., who died in 1876; Stanley R.; Anna E. who, in 1877, married Arthur E. Wright, a well-to-do farmer, of Machias; Gilbert T.; Ernest H.; Cora E.; Orville L., who died in 1870. Of the above-named children, Gilbert, Ernest, and Cora reside with their mother on the homestead farm.